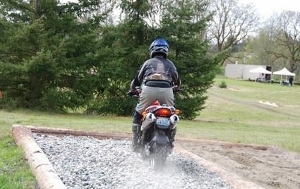 As pioneers in off-road training in Washington State, Puget Sound Safety is poised to redefine offerings not only in Washington State, but throughout the Pacific Northwest. It all started nearly a decade ago, when Puget Sound Safety began offering the MSF Dirt Bike School curriculum in Roy Washington. From there they added to their off-road program offerings, developing the “Adventure Camp” format as a three day offering which incorporated the MSF dirt bike school together with trail side basics such as cooking, bike recovery, on the fly maintenance tricks and evenings around the campfire. Adventure Camp took on a life of its own and became a rights-of-passage for hundreds of riders interested in dual sport and adventure touring, eager to get their feet wet using the class in Roy to launch their enthusiasm. Some got more than their feet wet when one class was taught in falling snow. But all things change and 2014 will mark a bold year for PSSOR as they venture beyond the Roy property and expand their offerings once again. For starters, the local version of Adventure Camp will take up new residence at Straddleline ORV Park, just off Highway 8 between Olympia and Elma. The site has long been a favorite for off-road enthusiasts providing numerous roads, two track and single track, both within the park and by way of its next door neighbor, the Capitol Forest. Straddleline features plenty of camping space and for those seeking a creature comfort, there are hot showers on the premises. For the first time ever, PSSOR will run two more Adventure Camp events out of state. The first is in early June at Fort Kalamath, southern Oregon. An Idaho City program follows the following weekend. For riders looking for some real-time training, PSSOR will offer 3-day early summer and late summer Back Country Discovery Route sessions, on the lower leg of the WABDR. The early summer class may include a snow workaround, if Mother Nature provides a late-season dumping beforehand. PSSOR will also be providing training at the Desert 100 event in April and the 2014 Touratech gathering in late June. For those interested in the MSF dirt bike school classes, these are still being taught, now at Straddleline and include separate classes for both kids and adults.